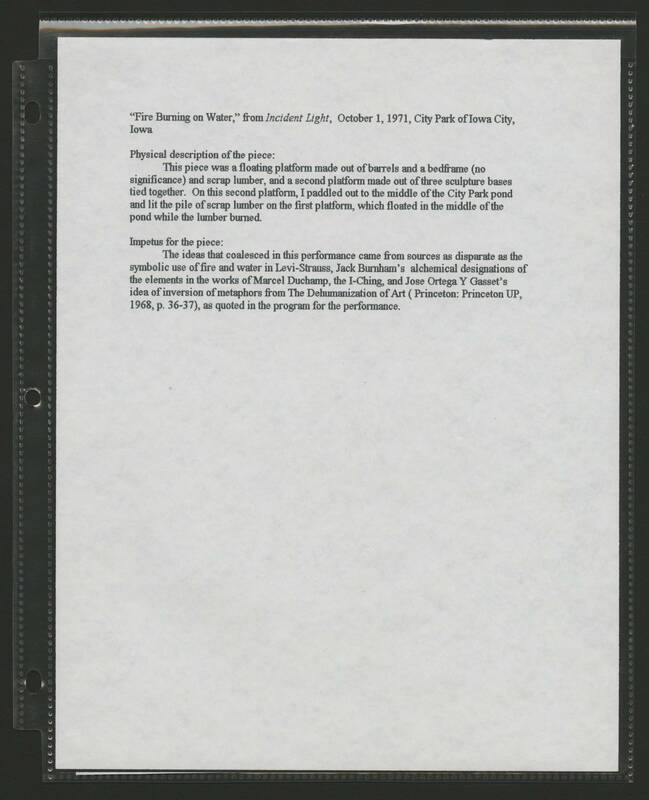 "Fire Burning on Water," from Incident Light, October 1, 1971, City park of Iowa City, Iowa. Physical description of the piece: This piece was a floating platform made out of barrels and a bedframe (no significance} and scrap lumber, and a second platform made out of three sculpture bases tied together. On this second platform, I paddled out to the middle of the City Park pond and lit the pile of scrap lumber on the first platform,which floated in the middle of the pond while the lumber burned. Impetus for the piece: The ideas that coalesced in this performance came from sources as disparate as the symbolic use of fire and water in Levi-Strauss, Jack Burnham's alchemical designations of the elements in the works of Marcel Duchamp, the I-Ching and Jose Ortega Y Gasset's idea of inversion of metaphors from The Dehumanization of Art (Princeton: Princeton UP, 1968, p. 36-37),as quoted in the program for the performance.